There are a few days in the year that I consider to be absolutely sacred when it comes to being allowed to indulge and one of those is definitely New Year’s Eve, if only because most calories consumed on this day are of the champagne nature. I love my wine no matter what, and the bubbly kind is no exception. Unfortunately, champagne isn’t always affordable - until this time of year!!! Several varieties are on sale at most stores right now and because I’ll be spending New Year’s Eve with a few of my girlfriends, I decided to pick up a couple of bottles that we could all enjoy. The sale at my local Smart & Final allowed me to get a ridiculous deal on some André champagne (2 for $5!!!) and was also pleased to note they had excellent sales for other spirits. I had already received a bottle of Smirnoff for Christmas and I was playing around with fruit & vodka infusions, so I didn't have to spend extra money on other stuff, and I thought it would be fun make a nice AFFORDABLE champagne martini for the last recipe of 2009. I was trying really hard to post this last night but I had internet issues yet again, so I apologize to those of you who are on the East coast and have already started your parties, as you'll need a few more hours to make the strawberry-infused vodka for this drink. You're more than welcome to use one of the many flavored vodkas out there, though! I know a couple brands have strawberry and other berry flavored spirits and champagne martinis are always fun no matter what you use in them. If you do have some time and the ingredients, give this a try! It's very easy to do your own fruit infusions with all sorts of spirits and I find they taste better anyway. If you only have a Brut champagne or Prosecco, no worries! The strawberry vodka will still give this a lovely pink color. Lastly, I used frozen strawberries for my recipe because that's all I had on hand, but if you've somehow found decent fresh strawberries out there, you can use those as well. This is a light & sweet cocktail that is perfect for those who aren't really into traditional martinis. Hope you all have a fabulous and safe New Year's Eve and I'll see you in 2010!!!!!!!! Prepare the berry infused vodka by combining the strawberries & vodka in an airtight container and placing it away from direct light for about 2-4 hours. When ready to serve, carefully strain the vodka into a separate container and discard the berries. To serve, place a couple of strawberries at the bottom of each glass and add a 1 1/2 oz. of the vodka. Top off with the pink champagne and enjoy!!! As many of you know, I've had a rough couple of months, physically. Well, let me rephrase that: this entire YEAR has been tough on me when it comes to ye olde bod! It's partly due to general bad luck and partly because I'm accident prone klutz, but it's made it so that I couldn't really get in as much exercise as I would have liked in '09. I was doing Billy Blanks Ultimate Bootcamp workouts 4 times a week and then I messed up my elbow and my toe; started a serious walking regimen and sprained my ankle & got walking pneumonia, etc, etc. Needless to say, it's been tough to keep moving, which is the only way I can stay svelte because I have the slowest metabolism EVER! I'm not one to let that get me down, though; all December long (until last Wednesday, in fact; I have no power over homemade baklava), I have not only resisted the mountains of chocolate and baked goods that have been all over my office - not to mention the results of the bake-off Mom and I had over Christmas weekend - I have also gotten a jumpstart on the New Year workout craze despite my messed up ankle by rediscovering Pilates. I used to do Pilates daily for years and the results really showed, so I figured it was the best & quickest way to get back into the swing of things without further injuring my foot. This month I've already lost a total of 2.5" from my waist & hips because of my dedication to Pilates and can't wait to see even more results now that I'm completely addicted again! Anyway, I figured since I'd indulged in a bit too much cheese due to my gorgeous new cheese board set and in the results of Mom's baking prowess over the weekend (why does Mom food always taste better? ), I would be a very good girl this week, especially since I hope to enjoy plenty of champagne on New Year's Eve. I also thought it would be nice to bring you all along with me so that you, too, can get a jumpstart on those weight loss goals EVERYONE seems to have during the New Year. Why wait until January, right? Today's recipe is another super easy dish that I whipped up at work with the few ingredients I managed to throw into my bag before my ride left me this morning (Mondays are hard enough; Mondays after a 4-day Christmas weekend - even worse!). Sure, this probably seems more like a summertime recipe, but again - why wait 'til next year to have something light, healthy and completely delicious? As with most of my bean salads, this is quite easy to prepare and will go nicely atop a generous amount of your favorite greens. This dish is packed with protein & fiber to keep you full and energized for hours, and you'd never know it's good for you by the flavor. With a sweet & slightly spicy dressing, this festive looking little salad tastes just wonderful and nothing like a "healthy" dish. And everyone can enjoy this: it's gluten-free, vegan, low carb, low cal, and all that jazz. And did I mention it's just under $2/serving? Prepare the dressing by whisking all dressing ingredients together until completely combined. 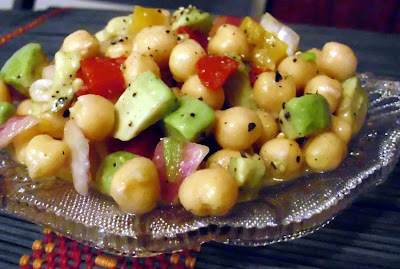 Combine the beans and all the veggies in a medium bowl and toss together with the dressing. Garnish with extra black pepper if you like, serve over plenty of fresh greens or by itself, and enjoy! Ahhhh, Christmas! It’s literally around the corner and I’m sure a lot of folks out there are still scrambling about to get all the last minute details of the holiday taken care of. I’ll be spending half my holiday in San Jose with me mum and the other half here in Sac (still with me mum; we like to share these things), and except for the fact that my Dad’s Christmas gift is going to get there closer to when the 3 wise men actually got to Baby Jesus, I’m actually kinda prepared this year. So, in honor of this year’s Boy Scout-like preparedness, I thought I’d put together a few recipe ideas - from brunch to dinner to desserts & drinks – that you can try in case you’re still running around like crazy and haven’t figured out what to serve for the holidays! May you and yours have a beautiful and very Merry Christmas! So is everyone tired of holiday sweets & treats yet? I’m not (at least, not yet), but it is rather off-putting when practically every food site is shoving cookies, roasts, and stuffing in one’s face. Don’t get me wrong, I am in FULL holiday mode, complete with garlands in my living room, jingle bell earrings on my ears, and Christmas-themed spatulas in hand so I can mix my Christmas goodies; however, holiday overload can be just that: overload. With all the cranberries, turkeys, baked goods, etc, out there, it’s almost hard to remember what exactly one eats when it’s not Thanksgiving-through-Christmas. Fortunately you have me, someone who is constantly mindful of these things, if only for the selfish reason of not having to subject myself to TOO much holiday goodness, so I thought I’d share a super simple recipe that most folks can enjoy as a “real world” departure from Holidayland. Now, when I first posted about seitan, I honestly thought I’d start losing readers because it’s just not the sort of thing most food bloggers post about. I mean, really; it’s not the most attractive food at first, and the thousands that are afflicted with some sort of wheat allergy cannot partake of this great protein source, making it difficult for everyone to enjoy. However, after seeing that a lot of my recent traffic is actually driven by seitan searches, I realized I was not quite as crazy as I thought and decided to share another of my favorite ways to use seitan: Sweet & Sour! 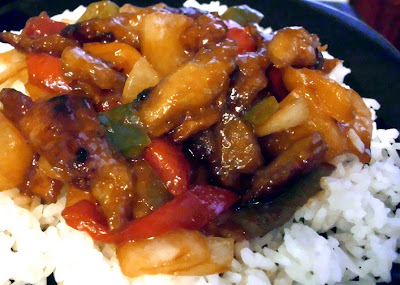 I think EVERYONE likes sweet & sour something for one reason or another: the sweet and/or the sour; the peppers; the sauce; the crispy chicken/pork/etc. in sauce. It’s so not the best thing for you but so delicious anyhow. Because I’m bare-bonesin’ it until sometime in January (or until Mommy spoils me, whichever comes first), I have a very short list of items that are currently gracing my refrigerator: a package of chicken style seitan; some navel oranges; baby spinach; stone ground mustard; rice vinegar; and a package of lavash bread. Not exactly the type of ingredients that will become something fabulous in the future, even with MY creative brain. I had to do something, so I turned to my freezer and cupboards, which was ever so kind in showing me things like pepper strips and brown sugar, respectively. I had soy sauce, some rice, even a can of pineapple; I was set. Though this is not your typical Asian-food fare, it’s still rather tasty and harkens up memories of Chinese takeout without being anywhere NEAR as bad for you. Using seitan, far less sodium and a lot less fat, this is one sweet & sour dish that won’t leave you feeling guilty. And at just about $2.25/serving, you can safely tell Santa that you’ve been nice this year, no matter how naughty this tastes! Prepare the sauce by combining all the sauce ingredients in a small saucepan and whisking together over medium low heat until slightly thick. Cover and set aside. Cut the seitan into 1½“strips and marinate briefly in the soy sauce. Add the garlic and the cornstarch and toss until the seitan is completely coated. Heat the oil over medium high heat in a large skillet, then add the seitan. Pan fry until the seitan has turned a golden brown and is crispy on the outside. Add the pepper strips and onions and cook until heated (about 2 minutes). Add a generous amount of sauce and the pineapple chunks and stir until combined & heated through. Serve over white rice or noodles with extra sauce if you like, and enjoy! It was another cold December night last night and there I was, making soup again, surprise, surprise. I’m sure a lot of you are wondering why I’m so soup happy these days, and aside from the fact that I am just slightly obsessed by it these days and that it helps a Poor Girl stay warm during the winter, it also just makes good economic sense. As I mention in Tip #4, Never Underestimate the Power of Soup, not only is homemade soup filling and pleasing to the palate, it makes use of simple ingredients to create a lot of food that will go a long way, thereby stretching your budget. 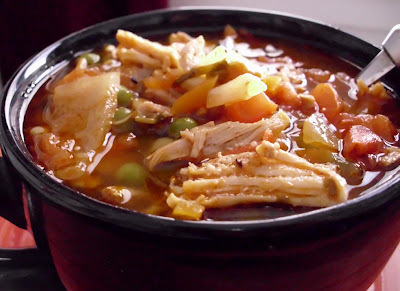 By spending $8-10 on the ingredients for a hearty soup that will make at least 6 large servings rather than spending those same $8-10 on 1½ extra value meals at your local fast food joint, you are helping your health and helping your hard-earned money last just a tiny bit longer. Not to mention that the soup options are unending! You can literally make it out of anything, and the more I play around with different soup concoctions, the more I fall in food love. This time I got inspired by the beauty and practicality of the ingredients I had on hand, namely the cute litter butternut and perfectly shaped acorn squashes I still had in my big bowl. Their versatility never ceases to amaze me and I made sure to make good use of that in this recipe. Many times you find that you don’t need manmade bowls or plates because nature has taken care of that for you. Case in point: the acorn squash. Its round shape makes it perfect for doubling as a bowl and used for stuffing a great deal of the time, while its range of colors and its decorative look make it quite aesthetically pleasing. I thought it would be fun to make a nice soup out of the butternut squash and use my acorn squash halves as my “bowls”. However, I didn’t want the similar nutty squash flavors to become muddled together so that they’d be difficult to distinguish, and I needed a way to use a lone leek I still had in the fridge, so I decided to add said leek to the soup for a twist on the way this would taste. Except for the time it takes to roast the squashes and chop the veggies, this is pretty easy to make. Though it’s a bisque, it’s on the healthier side because there isn’t too much in the way of heavy whipping cream or butter; rather, I used just a little bit of olive oil and plenty of tasty vegetable stock, with just the tiniest amount of milk to make things a little creamier. Vegans or those who cannot consume dairy, don’t fret! To make this work for you, simply replace the 1/2 cup of milk in the recipe with 1/2 cup of vegetable stock. Lastly, don’t feel like you have to serve this in the acorn squash bowls! If you don’t have them, don’t run out & buy them, simply make the butternut & leek bisque on its own and serve in a pretty bowl. Now for the recipe! Preheat the oven to 425°. Peel, seed & chop the butternut squash into 1” cubes and toss together with 1 tablespoon of olive oil and a bit of salt & pepper. Cut the acorn squash in half and remove the seeds and as much of the stringy part of the flesh as you can without digging too far into it. Place the acorn squash halves face down in a shallow baking pan with 1-2 tablespoons of water, and arrange the butternut squash cubes in a single layer on a foil-lined baking sheet. Place both items into the oven and bake/roast for about 25-30 minutes, until both squashes are tender when pierced with a fork. Remove from oven and allow to cool. In a large pot heat the olive oil and add the garlic & onions. Heat over medium high heat until they’re both fragrant, and then add the leeks and carrots and all the herbs & seasonings. Cook until the carrots begin to soften, then add the roasted butternut squash cubes, followed by the vegetable stock. Bring to a simmer and cook for about 3-4 minutes. Remove from heat, place the soup into a blender and purée until smooth. Add the milk and the honey and blend until completely incorporated. Return to the stove and finish over medium-low heat for about 7 more minutes or so. To serve, slice a very thin section from the bottom of your acorn squash “bowls” so that they don’t wobble & spill your soup. Ladle the butternut-leek bisque into each bowl, garnish with extra paprika, and enjoy! 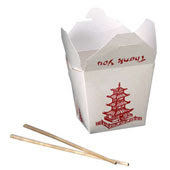 Tip #10: Recycle Your Takeout - All of It! Let’s face it: there are times in everyone’s lives where cooking is just not an option because of time constraints, illness, or just plain old fashioned laziness. Thankfully, man has invented takeout and delivery, leaving one less thing to deal with in our busy lives. Though I don’t do it anywhere near as often as I used to, there are times when I just want my food to be brought to me and I will get some takeout, or in my car-less situation, delivery. Of course, the types of food you can get delivered are pretty limited (unless you live in New York City where they deliver EVERYTHING), but one can never go wrong with a good pizza, some Chinese food, or even sushi if you’re really lucky (like I am with Sacramento’s Tamaya Sushi). You have something "fun", there's little to no clean up if you eat out of the container with chopsticks or on the paper plates that are provided, and most of the time you can count on leftovers. Though the price of this convenience is always super high - for the price of an extra large pizza delivered to my home, I can do an entire $25 Shopping Cart that will give me at least 10 days worth of fresher, healthier food - it's still a nice option to have. ~ Pizza/Italian: Aside from the standard leftovers, be sure to hang on to those packets or containers of parmesan cheese and red chili flakes! Place them in airtight containers so that you can use them for different recipes in the future. When you’re on an extremely tight budget these can come in really handy! We all know that parmesan cheese is sometimes not that affordable, whether it’s fresh or pre-grated, and believe me, these little packets do add up when you put them all together. Same thing applies to the red chili flakes that they give you. These small amounts can help you replenish what you use without having to spend too much extra money on some new spices. A little bit here, a little bit there adds up very quickly. ~ Chinese: Done with all the yummy leftovers but still stuck with 3-4 extra boxes of steamed rice? Don’t let it sit there until you have to throw it away – make your own homemade fried rice! Simply add mixed veggies, a couple of scrambled eggs, chopped green onions and some soy sauce, and you’ll be set. 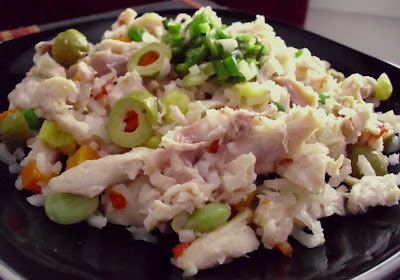 If you don’t want a repeat of Chinese food, use the rice in soups, as the base for Arroz con Pavo (or pollo), or make a nice rice salad. There are plenty of ways to make these leftovers work for you so you can make the most of your order! And don’t forget the soy sauce packets, either. These are lifesavers if you’re in a pinch and need a little bit of flavor in your dish. ~ Mexican: This is more of a takeout thing rather than delivery, but the same rules apply. Like other restaurants, Mexican restaurants will give you far more food than most folks can handle when they pack up your To Go order. You order what seems like a simple recipe and you’re left with Mexican rice, beans and tortillas to feed a small army! This is a wonderful thing, however, because you’re now left with the basics for making some simple bean & rice burritos for the next day’s lunch. Simply add your favorite salsa & condiments and you’re set. Too many leftover tortilla chips? Add a generous amount of shredded cheese, some shredded leftover chicken and your favorite fixings, and presto! Easy chicken nachos! Those of you who follow me on Facebook know that my new job has me working at the Catholic Diocese, a job I truly enjoy at the moment. The Diocese has its own newspaper (two, in fact, they just couldn't figure out how to get me into the Spanish paper, though I'm on that task like white on rice), and it focuses on a variety of issues that face the Church and the city as a whole. During Thanksgiving, The Catholic Herald did a special "giving back" feature that focused on people within our local Catholic community that were helping others in different ways. I thought it was great that my direct boss and the editor at the Herald thought that my small contribution was newsworthy enough and I'm proud to have it featured in their publication. Though I love showing off the miserly but delicious foods I eat on a regular basis, I also love showing folks -whether rich or poor - how to enjoy one of the most basic pleasures of life - food - in a non-guilt-ridden way. Click on the following link for the full story, and please keep in mind this season that there are several out there who truly cannot afford this basic, simple need of nutrition. If you can, PLEASE donate to your local foodbanks or churches and give those who can't afford it on their own, the gift of good food. And if it's after Christmas, please keep donating; hunger knows no bounds, and it will keep haunting the needy no matter what date falls on the calendar. The fine folks at Foodbuzz recently teamed up with an amazing new sponsor: Pepperidge Farm! I'm sure many of you out there have at least one Pepperidge Farm favorite, be it their fun Goldfish snacks, incredible Sausalito cookie, or the always classic Milano. They're not all about snacks though, and those of us in the Tastemaker Program had the opportunity to give their puff pastry sheets a try on the house. It took me awhile to be well enough to hobble to Safeway to pick some up but I was finally able to do so this weekend and proceeded to get my bake on. My only problem, however, was deciding what to make. I mean, seriously! With puff pastry the possibilities are endless! After reining in some of my loftier ideas which involved ingredients I neither had nor would be able to afford anytime soon, I decided to make something easy but definitely tasty. Using some red potatoes that were starting to eye me more than they should have and some lovely green leeks, I created a fun little appetizer that would be fun to serve at a holiday party or any special food event you might be having. And except for the sinful little puff pastry this simple mixture is wrapped in, this is probably one of the lesser evils of a holiday spread. Now you're probably wondering how a puff pastry recipe can be so inexpensive; most of the time these flaky treats can cost up $5/each at a store or restaurant. But that's the beauty of making things at home! With 1 package of puff pastry sheets that costs around $5 at most major grocery stores, half a leek and just a few baby red potatoes, you can make one dozen of these tasty little pockets. The whole recipe works out to about $8.50, making each of these just around $0.70! Gotta love that! And because they're filled with good stuff and not just fluff, they will definitely be satisfying. Just a couple things to note on this recipe: you MUST make sure that everything is finely chopped and resist the temptation to use a lot of filling per pocket. Puff pastry does just what it says: it puffs! And if you're making something that's supposed to be completely enclosed within the pastry, it's imperative that you give the pastry enough room to expand. Of course, there's no need to be stingy; just be careful not to overstuff and seal your litte puff pastry pocket well so that none of the good stuff escapes. And now for the recipe! Thaw the puff pastry sheets according to package instructions. Preheat the oven to 400° and prepare a baking sheet with parchment paper. Heat the olive oil in a large skillet then add the minced garlic. Cook over medium high heat until lightly browned & fragrant. Add the diced potatoes and stir fry quickly, seasoning with the salt & pepper. Cover and cook for about 2 minutes or until the potatoes just become tender. Turn off the heat and add the chopped leeks and the parmesan cheese, mixing together well. Cover and set aside. Cut the pastry sheets into three long strips along the fold lines, then cut each strip in half. Place about 1 1/2 tablespoons of the potato & leek mixture in the center. Fold one corner of the pastry over the filling, then fold the opposite corner on top of that, tucking the fillin into the center as much as possible. Take the other two corners of the pastry sheet and pinch together, twisting the two ends together at the top for a decorative look. If there are any gaps in the dough, gently pinch them closed with your fingers to completely seal the pouch. Lightly beat the egg with the tablespoon of water until just combined. Brush the egg wash on top of the pastry pouches and then place them on the parchment lined baking sheet. Bake for 20-22 minutes or until the pastries have puffed up and turned golden brown. Remove from oven & allow to cool a bit before serving. Serve warm or at room temperature, and enjoy! Many years ago I worked as a mental health counselor for a couple of board & care facilities. Among the many duties we were supposed to perform was the great task of cooking for 18 people, sometimes up to 40 depending on whether we had something special planned for our clients. Needless to say, I got really good at cooking for a small army and prided myself in being the cook all of the clients wanted to make their meals for them (some of my coworkers were, sadly, not very adept in the kitchen). Unfortunately a lot of the recipes we worked from were not in the healthiest vein, partly because of what was donated to us and partly because there is only so much a non-profit can actually afford to buy. Still, there were wonderful things I ended up doing to pork loin and chicken (culinarily, of course, for my naughty-minded friends who read this) and I think the whole experience really helped me hone my Poor Girl skills long before I became said Girl. The following recipe is a healthier adaptation of a very simple, non-rocket-science, easy-to-make casserole that my crisis house clients used to love, mainly because of the insane amount of cheese that was involved. I know, I know, I was just praising myself in my last post for my ability to get over the cheese addiction, but I didn't say I was totally over my favorite dairy product! I can just control it better these days. :) Though this has a fair amount of cheese to be pleasing, I use non-fat milk, brown rice pasta and fresh broccoli & cauliflower to make up for the sinful stuff. The original version calls for about double this amount of cheese, a ton of white pasta and Velveeta (for crying out loud! ), not to mention half a chicken or so, making it a caloric nightmare. The excess of measurements alone also made the original a rather costly affair, the only redeeming quality being that I could make use of the vegetables I knew my clients wouldn't eat otherwise (Moms & dads of finicky eaters, take note: this is one possible way to get those veggies into otherwise reluctant little mouths!). By reducing the amount of cheese, omitting the chicken and throwing in those vegetable remnants that sometimes get forgotten in the refrigerator drawers, this goes down not only in calories & fat grams, but in price as well. Of course, if you have some available and want to add a little bit of leftover chicken, by all means do so! But I wouldn't suggest going out of your way to add it, unless you are looking to make this the entrée for your meal. This is a great meatless entree but works far better as a side in my opinion. 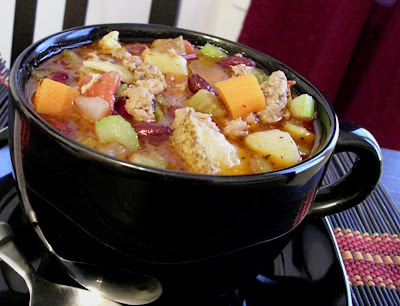 Let's check out this super-simple but comfort-foodie recipe. Preheat the oven to 400°. In a small saucepan combine the milk, cream of mushroom soup, garlic, and salt & pepper, and whisk together over medium low heat until smooth. Combine the pasta, broccoli, cauliflower and 3/4 c of cheese in a large bowl and add the mushroom soup, folding everything together so it's evenly mixed. Lightly spray a 9" x 12" casserole dish with cooking spray and add the pasta & veggie mixture. Sprinkle the remaining cheese on top and bake for 20-25 minutes, until the cheese is melted & bubbly. Serve as a side or with a salad as a meatless entree and enjoy! What a rough couple of weeks! Sorry things have been so slow around here but as I mentioned in my last post, after enjoying the Thanksgiving festivities I was knocked down with walking pneumonia, something I had never had and don’t recommend (although the free ab toning and weight loss was a nice bonus, lol). Normally if I’m sick I know I have to cook something for myself to make sure I keep going but this hit me so hard there were times I forgot I had a kitchen or the need to eat. Fortunately after a lot of rest (a week off work – D’OH! I shudder to think of the financial consequences of this…) and plenty of meds I am back at work and back in the kitchen. I’m still not 100% but I’m definitely much better than I have been the past couple of weeks and couldn’t be happier about that. So far I’ve had a blast making a huge batch of my (almost) famous Hearty Mushroom & Potato Soup and toying around with the beginnings of the recipe I am about to feature. It’s great to be back in my kitchen and even better to be back in blogging mode. I don’t know about all of you but after I’m really sick I just want to eat a lot of healthy and green things. I’m not sure if it’s something my body craves to detox itself from the ickiness of meds or if it’s something purely psychological, but the last thing I want to eat is anything unhealthy! I crave leafy greens, fresh vegetables, LIFE. 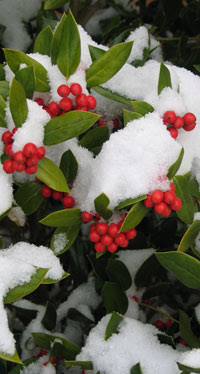 Unfortunately it’s too friggin’ cold here in Sacramento to really enjoy these things in their perfectly raw state (we had SNOW on Monday, for crying out loud! ), so I thought I’d improvise a bit. I had some gorgeous beets still hanging around from the last time I went shopping that I knew I’d be roasting and putting into something eventually. I remembered I’d rinsed & saved their beautiful greens too, so I wanted to make sure to use those before it was too late. Now you all know how I feel about my roasted beets - I LOVE them! The sad part is that I haven't really played much with the incredibly healthy greens that come along with them. I've tossed them in a couple of stir-frys here and there just for texture but I've never experimented with their own unique flavor. I thought it would be fun to contrast their very slight bitterness against the natural sweetness of the actual beets, with the extra treat of roasted pears. Though I'm sure a good Bosc pear would be great in this recipe because of its firmness, feel free to use any pear varietal that you might have at your disposal; it's the sweetness & texture that counts more than the actual type of pear. (NOTE: I do not recommend adding too much to the pears in the way of spices as this will detract from the simplicity of the flavors and not go well with the beets.) A simple balsamic-honey dressing tossed with this early winter salad brings everything together, and the addition of gorgonzola crumbles adds extra zip. I would imagine adding some sort of candied nut like walnuts or pecans would just put this dish over the top in excellence, but alas, Poor Girl must make due with what she's got. I'm not complaining, though! This is a great side dish that easy to make and would probably go well with a nice pork loin, though I ate my big bowl of early winter goodness on its own. It definitely gave me the health boost I needed and now I'm ready to start concocting another sinful dessert to bring to you later this week. ;) But first, eat your veggies! Preheat the oven to 425°. Prepare the glaze by whisking together the honey and balsamic vinaigrette until smooth and set aside. Cut the greens from the beets and rinse very well, drying with plenty of paper towels or with a salad spinner. Chop the leaves and stems coarsely (about 2” strips) and set aside in a large bowl. Scrub the beets well, wrap each in foil and place in the oven to roast for about 15 minutes. In the meantime, rinse and core the pears (peeling is optional; sometimes the aesthetics of the peel are quite lovely) and cut into 1” thick slices. Toss the pear slices with the brown sugar and place in a baking dish that’s been greased with the butter. Place in the oven (on a separate rack, of course) along with the beets after the beets have passed the 15 minute mark and roast for another 10 minutes. The beets should be easily pierced with a fork and the pears should be tender but still slightly firm. After allowing the beets to cool for a few minutes, carefully remove the skin under cold running water. Slice into ½” thick slices or wedges. In a large skillet heat the olive oil over medium high heat. Add the beet stems, garlic, salt & pepper and sauté until the stems begin to soften (about 2 minutes), then add the greens. Saute quickly until the beets just begin to wilt – do not overcook! The leaves should still retain some of their texture and not be mushy. Place a generous amount of greens in a large bowl or on a plate followed by the roasted beets and pears. Drizzle the glaze on top, add as much crumbled gorgonzola as you like, and enjoy! So Poor Girl ended up getting a nasty little case of walking pneumonia this week (instead of the "bad chest cold" I originally thought I had), so you'll have to forgive me for being out of the kitchen for awhile. Fortunately, my mom made plenty of her famous Arroz con Pavo (Turkey & Veggie Rice) this year and aside from the standard Thanksgiving leftovers and my new Turkey Chipotle Soup, I've been pretty much living off this great little dish. I originally posted this recipe last year at this time, but the picture I took with my phone's camera was sad, grainy and pathetic, and it certainly didn't do the dish any justice. I figured I'd take a new shot for everyone today and remind you of this great, healthy, and economical way to keep stretching those Thanksgiving leftovers. Let's face it: there are only so many turkey sandwiches one can handle after awhile, and what's great about this meal is that it will last you forever. I believe my original post mentions that it feeds a small army, which is completely true. But the cost? This will yield about 15 cups of finished product (!!!!!!!) and the entire recipe will cost you only $18. Depending on appetite, that translates into about 20-some odd servings, so your cost per serving comes out to a mere $0.95/serving! Now THAT is eating ridiculously well on a miniscule budget. Except for last year’s fluke, I always seem to get sick around the Thanksgiving holiday. This year I almost got through the weekend without getting sick but the stress of work and traveling with plenty of other flu-infested folks finally caught up to me and I am now a raging little ball of bronchitis & flu. It’s certainly not helping much in terms of finances; considering the time lost due to the sprained ankle and now this, I am going to be bare bones-ing it through the New Year. The good news is that my Mom & Auntie really spoiled me over the holiday and I also got to bring home the majority of the Thanksgiving leftovers. Like most of you, I am now drowning in stuffing, yams and the inevitable turkey. Since I have had absolutely zero energy and desire to cook, I was actually dreaming of canned soup that could be easily heated; then I snapped out of it and decided to make a nice, spicy soup to make use of the many leftovers that are filling my fridge right now. I was actually going to make more Sick Person Soup with turkey instead of tofu, but because I’d had too much of that in October, I figured I’d go in a different direction. 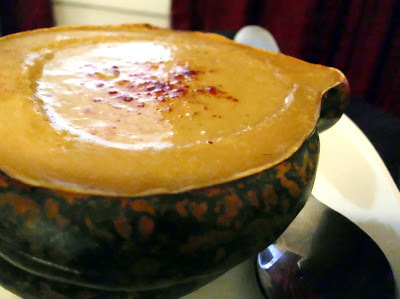 I contemplated making some more of my Hearty Mushroom & Potato Soup that turned out to be such a hit (I still get most of my new visitors from that recipe link; so amazing! ), but that involved far too much chopping for my energy level. Woozily I surveyed my food selection and chose a bunch of shredded turkey meat, turkey stock made from scratch and some mixed veggies that were hangin’ out in my freezer. A healthy dose of chipotle pepper would certainly help to provide the spiciness I craved to help unclog my head and chest, and a new, super easy soup recipe was born. Those of you who make your own meat or vegetable stocks know just how delicious, versatile and healthy these stocks can be, but for those of you who aren’t that convinced or think it’s too time-consuming to prepare a stock from scratch, allow me to throw in the whole use-of-leftovers-and-cost-reduction thing into the mix. From one large Thanksgiving turkey most of us will usually go for the meat and call it a day – a great way to make use of the bird, of course – but what about the giant set of bones that remains? Should they really be cast aside into the garbage bin? Not at all. Though it’s much better to use bones that have not yet been cooked to make a good stock, it is also possible to get very tasty results by using parts from a cooked bird. Simply make sure to remove as much of the cooked meat from the bones as possible so that you create a cleaner stock. Of course, it’s completely okay to use chicken broth to make this soup if that’s all you have on hand or are unsure of how to make a good stock. When I feel better I will certainly be posting the recipe for my turkey stock, filled with yummy spices & flavors that will fill your entire kitchen with a delicious aroma. For now, check out this super simple recipe that will not only unclog your sinuses, but will also help you figure out what to do with all that leftover turkey meat. In a large pot over medium high heat, add the olive oil, garlic and diced onion and cook until the onion becomes translucent and the garlic begins to brown. Add the tomato, chipotle peppers, salt and cumin, sauté for about 2 minutes. Next, add the turkey stock and water. Bring to a low boil and then add the turkey meat and mixed veggies. Simmer for about 10 minutes or so, until all the flavors are combined and the aroma permeates the air. Serve generous amounts of the soup in large bowls, garnish with cilantro and enjoy! 2009 has flown by so fast it's almost unbelievable! I swear I just posted the two New Year's Day quinoa recipes a couple of months ago. What's just dawned on me recently (even though it's all over the news) is that it's also the end of this decade, and that's even more unfathomable to me. It's been a very odd, difficult decade for most of the world, so here's to having a much better decade come January 1st. Except for spraining my ankle and getting pretty sick again in November, I have to say it was a total blast in PGEW land! The Foodbuzz Blogger Festival was incredible, there was more press coverage for my little blog, and I was selected to be a part of my first Foodbuzz 24, 24, 24 feature, in which 24 bloggers post about 24 different meals in 24 different hours. If you haven't already checked out the coverage of my After Thanksgiving Colombian Tapas Party, you should do so right now! It's a lengthy post but is full of great photos and has 4 new recipes that you might want to try at some point. So what's there to look forward to this month? 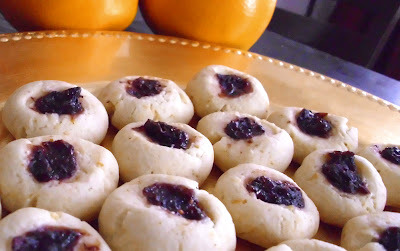 ~ A couple more recipes inspired by the After Thanksgiving Colombian Tapas Party! Buñuelos are easy to eat but a bit more challenging to make correctly, so I wanted it to have its own little post. This is a very traditional Colombian snack that is usually eaten during the holidays with other fun treats, so for those of you who are adventurous and have never tried them, give these a shot. ~ Though we had a relatively tiny turkey for this year's Thanksgiving (we're used to getting a gigantic bird every year, so a 17lb turkey was almost insulting, lol), I'm still drowning in leftovers. The Tapas Party helped me get rid of some of them, but there's a lot more I can do with the stuff I've got in the fridge, so stay tuned for some very interesting leftover recipes! ~ Christmas, Hanukkah, and all the other wonderful holidays of the season are swiftly approaching, so I know you'll all need gifts! Check out the new PGEW Store in the left sidebar (with only 1 item, but don't worry... I have other stuff up my sleeve) and purchase a few copies of the Poor Girl Eats Well - To Go! mini book to use as stocking stuffers or Secret Santa gifts! They're just $10 and feature 13 recipes and 4 tips that will help anyone get started on eating well on a teeny tiny budget. ~ More dessert's a-comin' this month! Sweet treats are a big part of December cooking all over the world, so be on the lookout for some ideas that will taste naughty but be totally nice to your wallet.